It's worth reminding you every once in a while that DC puts out great, affordable reprints of their classic material in these black and white showcase books. 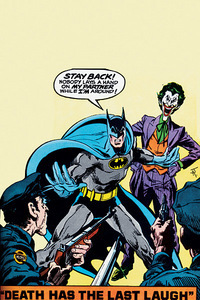 The latest collects some comics that are near and dear to my heart - mid '70s era Brave and the Bold comics with art by the MAN, the late Jim Aparo. His Batman was the definitive Batman for me when I was growing up and here you get to see his take on various other characters who team up with Bats like Mister Miracle, The Demon, Aquaman and even The Joker. These are fun stand alone stories and you get 25 of them for just $17. One of the most acclaimed manga of the past ten years reaches its conclusion with the final, 18th volume hitting the US this week. 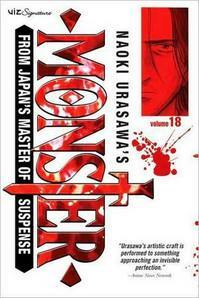 If you're not following it, Monster is about a Japanese doctor living in Germany who once saved the life of a young boy. Eleven years later he finds that the boy has grown up into a sociopath who is plotting an inhuman massacre that the doctor hopes that he can stop. The story has moved from Dusseldorf to Berlin to Munich to Prague to a small village in Germany where the final chapter unfolds. This book has been adapted into an episodic anime and a US film is planned for release next year. Some consider this the Watchmen of manga so if that strikes a chord with you, check it out from the beginning. If you've been following it all the way through, then you must be excited to see how it all ends. 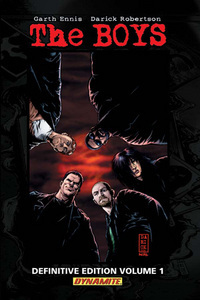 The Boys is an ongoing superheroes-behaving-badly comic by Mr. Cynicism himself, Garth Ennis, and artist Darick Robertson. The book started its life as a DC comic until the Powers That Be caught wind that it was full of thinly veiled versions of their trademark characters doing awful things to each other. It has since moved over to Dynamite Entertainment and has really evolved into an excellent book. Seventy five bucks for a hardcover collection is a tough pill to swallow but you should at least pick up the first softcover volume for fifteen bucks or whatever if you want to give it a try. I highly recommend it but I warn you that you need to be open-minded to scenes of superheroes sexually harassing each other and blithely dismembering innocent civilians in their quest to defeat the bad guys. 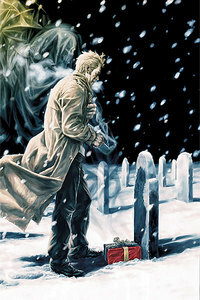 Vertigo's longest running comic book reaches it's milestone 250th issue and to commemorate, they've assembled an all-star creative team to tell five holiday themed stories about supernatural con man, John Constantine. This is a little like, "John Constantine, This Is Your Life" with just about every creator that has worked on this book being brought out from behind the curtain to say hello to John again. People like Brian Azzarello, David Lloyd, Sean Philips, Eddie Campbell and original series writer Jamie Delano. Plus there's some people that are new to the Hellblazer world like Dave Gibbons, Peter Milligan and Rafael Grampá. I think the only guy who couldn't make it was Constantine's creator, Alan Moore. 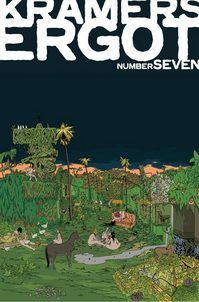 I'm sure when cartoonist and publisher Sammy Harkham started recruiting artists for the ambitious, over-sized seventh volume of his comic anthology/art project, Kramers Ergot, he wasn't anticipating a global economic meltdown. But you don't get to choose the economy that you publish in so Mr. Harkham finds himself releasing his long-awaiting $125 book to a suddenly cash-strapped public. The thing is, this is likely going to be the comic release of the year. For the admittedly high price you get a book that is not only freaking huge (clocking in at 16x21" and 96 pages) but it contains work by over 50 great cartoonists - both newcomers and big names - all doing original work on a tabloid size you're not used to seeing them at. We're talking some big names here like: Chris Ware, Daniel Clowes, Ivan Brunetti, Kim Deitch, Anders Nilsen, Adrian Tomine, Jaime Hernadez, Johnny Ryan, Matt Groening, Dash Shaw and many more. Besides, the Fed cut interests rates to near zero yesterday. This book might be worth taken out a loan for. If you've got $100 to spare I'd recommend Kramers Ergot 7 as I said above. However, Kramers Ergot 7 will not show you how Spider-man got his black costume. You can only find that here in this inexplicably pricey reprint of the classic Marvel event comic. Oh Ed Brubaker, what have you wrought? His deft weaving of noirish storytelling into books like Daredevil and Criminal seems to have inspired this new batch of Marvel comics that mixes 30s gangster movie cliches with radioactive spiders and stuff. Tales of Beanworld fans have been waiting ten years for a new book from Larry Marder. It's here now. Another one shot Thor in Asgard comic written by Matt Fraction. Man, I want to ck out that Kramer Ergot but the price. Ouch. Amazon has it for $78 though. said Baierman on December 17, 2008 3:54 PM. I'm scoring mine for about $50 after discounts and gift certificates. said Evil Richard on December 17, 2008 3:58 PM. said Baierman on December 17, 2008 4:47 PM.